At Banff Tours and Travels we believe in small group sizes, enabling guests to interact with our guides. View the stunning snow capped landscapes of Banff National Park and surrounding areas on a winter sightseeing tour. 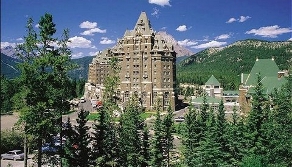 Banff Travel offers educational tour packages to the must-see locations in the Canadian Rockies. Tour the Banff World Heritage Site and learn 11,000 years worth of important historical and cultural events in the Canadian Rockies. Take this chance to observe wildlife in their natural habitat or view the frozen splendor of Bow Lake and Lake Louise on the way to Num Ti Jah Hunting Lodge. Both tours include a hot chocolate and a light snack as well as hotel pickup and drop off. Binoculars are provided for wildlife spotting and cave entrance is included at the Banff World Heritage Site.